In this video, you are riding with me on a section of Albany’s Periwinkle Path that is about to be rebuilt — whether it needs it or not, I’m tempted to add. Part of the segment that will be rebuilt and widened. Oak Street Apartments on the left. The city is advertising for bids to rebuild, and widen by two feet, 1,200 feet of the path from the southeast corner of Kinder Park past the new Oak Street Apartments to Queen Avenue. (I know this because I read the legal ad in the Democrat-Herald this morning. Who says nobody reads the legals, always stuck in the back of the paper in the smallest possible type?) Bids will be opened Sept. 10, and the city estimates the work will cost about $85,000. Completion is expected in October. 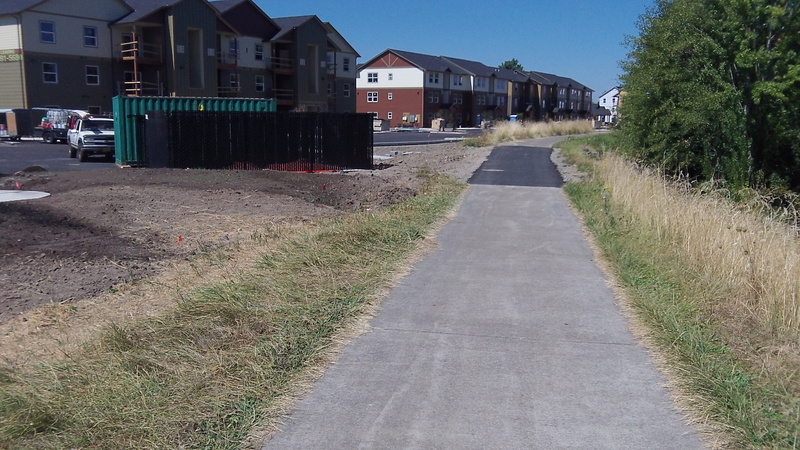 This is a segment of Albany’s first bike path, built in the 1970s along Periwinkle Creek. Except for a few cracks in the pavement, the path here is not really in bad shape. But the city is paying for the work partly with money from a federal block grant, and the segment lies within the part of town eligible for that kind of aid. Parks Director Ed Hodney explains that the entire length of the path, from Oak Street to Grand Prairie, was assessed a few years ago, and much of it was considered to be deteriorating. The city rebuilt the section along the edge of Kinder Park in 2011, paying for it with a state grant and park funds, and widening it to the current city standard of 10 feet. This is another example of spending tax $ on non-essential services. Fed tax money is not free money. The cost does not include City employee time to look for grants and apply for them and do all the paper work to complete such a project. I hope the voters will remove the big spenders and a new council will rein in this kind of un-necessary spending. We need a new City manager with a commitment to lower spending by reducing headcount. Well, more balderdash from the grumpiest man in Albany. Just because Tom doesn’t walk or ride on the Periwinkle path it becomes a non-essential. I guess when you get into your 70’s you forget all about those “non-essential” kids, teenagers, and retired newspaper editors who happily use the path regularly. Having a variety of means to get around is a plus in any community. If you hate federal programs then you need to take aim at the federal government, not the city. The money available for those grants WILL be spent. Albany can choose to not take it, but that will NOT end the program or cut the federal deficit. It will not also get paths repaired and improved, unless what Tom wants is a tax increase on city residents, which I bet he would oppose too. People like Tom had their way for a long while. They didn’t fix leaking pipes, or repair deteriorating streets. They did not invest to bring new business to town. They walked away while downtown deteriorated. They buried their heads in the sand. And all the people of Albany will be paying the additional price of trying to catch up on repairs for years. Tom, you have made it your career to tell everyone why they are wrong and only you are right. If you’re so concerned about wasted staff time you might start by reviewing the large amount of information demands you have placed on the city and the hundreds of hours it has taken to respond to them. That costs the taxpayers a lot money too. Well, let’s not criticize anyone for asking the city government — any government — for information on what it does or spends. If it takes “hundreds of hours” to respond, perhaps an easier or quicker way to respond should be found. As for the question of spending federal money because it is there, it’s true that the fault lies with Congress in setting up these programs and borrowing the money to keep them going. But it is also the obligation of citizens to complain and point out when something doesn’t make sense.